In a society driven by “speed” and “the desire for more” it’s easy to get caught up in trying to accomplish everything we want out of life right now. In the midst of the pursuit of success, we often lose touch of the real purpose in life. So many of us have been blessed by God, but sometimes we get so busy that we forget to take notice of the miracles surrounding us. The Essian Annual Charity Bowling Event is essentially a “time-out” from our daily lives to acknowledge our miracles and our gratitude so that we can share with the less fortunate. Children are one of the miracles that surround us everyday. Beyond our control, some do not share our daily comforts. Our mission is to provide a little extra support to these children and their agencies. Children are our future. We all contribute to building up the next generation in our own unique way; each with our God given gifts and talents. The Essian team is excited about the opportunity for everyone to come together and have COMPETITIVE FUN, all while still achieving this goal as ONE TEAM! 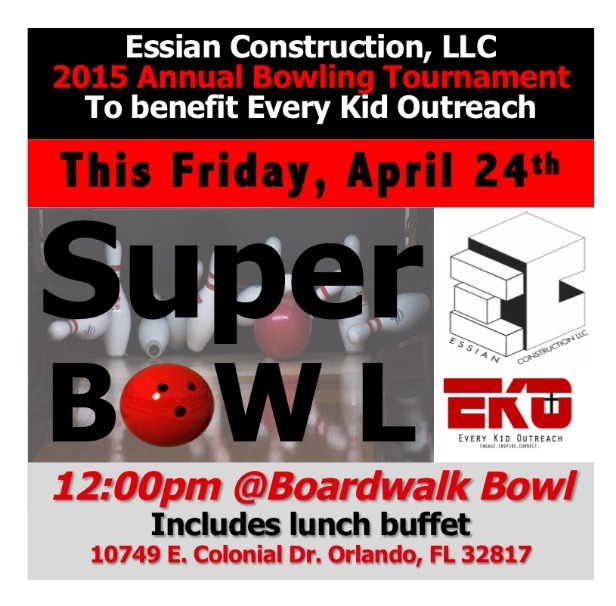 Join Essian Construction for our 6th Join us for our 6th Annual Charity Bowling Tournament! This years deserving recipient will be Every Kid Outreach!